You are in Japan, you already have a wired broadband internet connection, and you want to share that internet connection between multiple computers, either using network cables, or wirelessly. If you don’t already have a wired internet connection I can’t help you! The technical details of sharing a broadband connection in Japan are no different to doing the same elsewhere in the world. The difficulty might be that all the boxes, instruction manuals, and software are in Japanese. The language can make it hard to know what to buy, or how to get it working. I’ve found a cheap WiFi internet router that is very easy to setup. 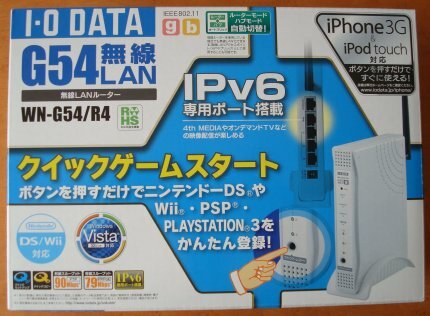 It is an I-O DATA G54 Lan model. It can distribute one internet connection amongst three computers using wires (network LAN cables), and you can connect many more computers (or iPhones, iPod Touches, DS Lites etc) to it wirelessly. Note that this is not a modem-router. You must already have an internet connection coming into your flat for this to work. This could either be the internet LAN cable coming out of the modem if your flat has its own modem, or a plain LAN cable coming out of the wall if your flat is already wired for internet (as is done in a lot of Leo Palace apartments for example). Here is the router box. It cost ¥3,980 from DEODEO – they are an electronics chain with stores around the country. You could buy the exact one that I did or if you have to get a different one here are some tips. Make sure you get a router, not a standalone hub or switch. They can look quite similar if you can’t read the writing. Hubs and switches will be cheaper. If it says WiFi on the box then it will definitely be a router, as you don’t get WiFi hubs or switches! On the next photo I’ve highlighted in red the bit that says ‘router’. 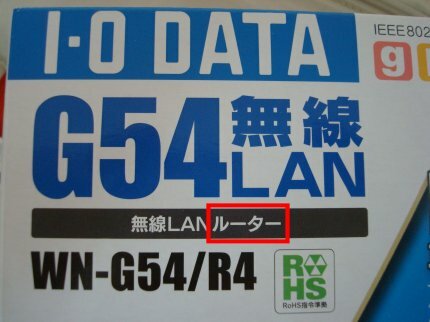 Router is written in the Katakana script using two symbols. Ru ル, and Ta タ. The dashes ー simply lengthen the sounds. If you are going electronics shopping then knowing Katakana is very useful as most of the computer terminology is written as English words but using the Katakana alphabet. In the box is the router, a stand, an aerial, power supply, a LAN cable, some instructions and a CD. You should be able to work out how to fit the aerial, put the router on the stand, and connect the power supply. If you got as far as buying a router in Japan then the next step is where you might get worried. Here are some of the instructions. 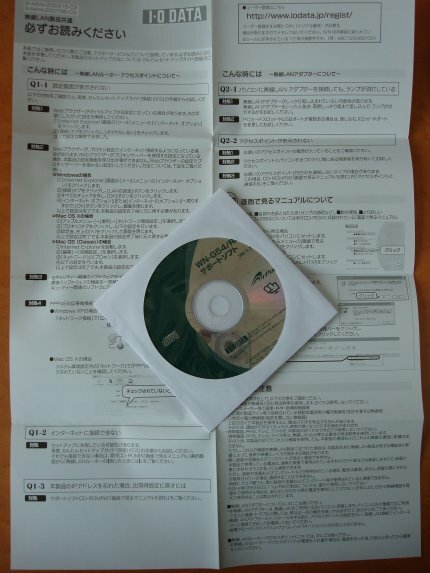 The instructions are all in Japanese and no doubt the CD is too. There are no English instructions. But don’t worry. The best advice is to ignore the instructions and the CD. Put them away, you don’t need them. Make sure your computer is on and connected to your normal wired internet. Make sure the internet is working as it would normally be. Switch the router on. Unplug the network cable from your computer and plug it into the router port that is labelled ‘Internet’. The internet light at the front of the router should turn on, or start flashing. Plug one end of the supplied LAN cable into one of the three ports labelled ‘LAN’. Don’t put it in the IPv6 port. Plug the other end of the supplied LAN cable into your computer, into the same port that was previously connected to your internet cable. Wait a few seconds for the computer to reconfigure itself, and then see if you can still browse the internet. If not try rebooting. If you can still browse the internet then that means the wired router is working as it should. You are now back where you started as you have a wired internet connection, but this time the internet traffic is passing through the router. 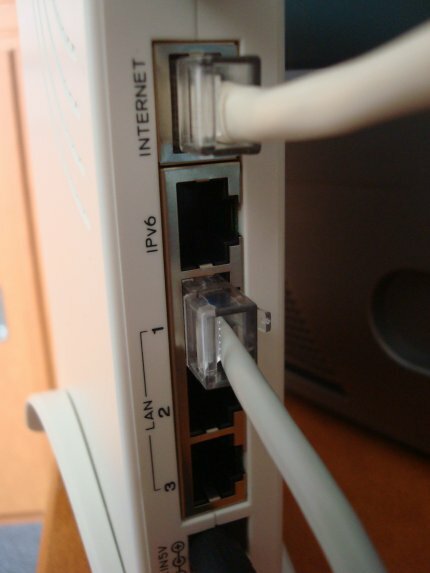 If you want to connect more computers using a wired cable then make a connection from one of the remaining two LAN ports to your other computer’s network port (you might need to buy more LAN cables if you don’t already have them. As long as you are using an operating system such as Windows or Mac OS X the computer should automatically connect to the internet as soon as you plug in the cable. If you want to connect more PCs (or other devices) wirelessly then go to step 6. This device has its WiFi turned on by default. You just need to know how to connect to it. You’ll find all the details you need to connect on a sticker on the side of the router. The name of the WiFi hotspot (SSID) will probably be ‘AirPort’. I’ve highlighted it in blue. On a side note this is nothing to do with Apple’s ‘AirPort’. I-O DATA own the AirPort trademark in Japan. Apple’s AirPort in Japan is called AirMac. When you connect to the WiFi hotspot from your other computer, iPod Touch or other device you’ll be asked for the password. The password is on the sticker. It is where the green square is. Once you have entered your password you should be connected! You can then do the same for whatever other wireless devices you have. Most routers these days should be that simple to setup. But if you want to change any settings from the default then you’ll need to access the router control panel. 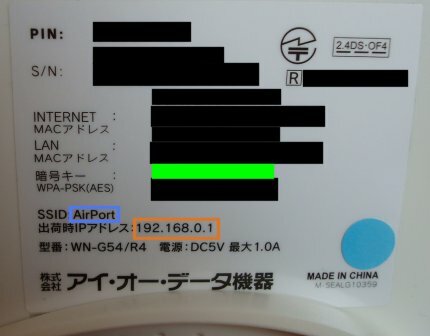 The address for accessing it is shown on the side of the router. I’ve highlighted the address in orange in the photo above. If you go to http://192.168.0.1 then you’ll see the control panel. The problem is that it is in Japanese. 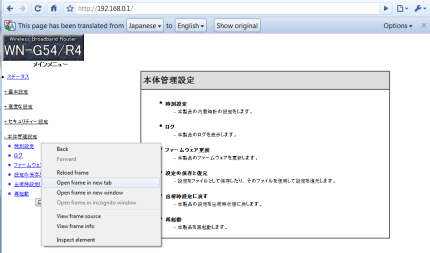 I’d recommend you use Google Chrome to access the control panel as Chrome makes it very easy to translate the Japanese into English. 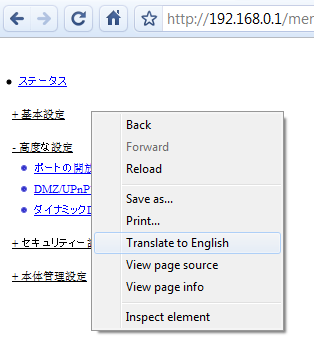 When you go to the control panel address Chrome will ask you if you want to translate it into English. You can click on Translate, but unfortunately the translation won’t work with this router. This is because Chrome is offering to translate the overall HTML frame rather than the two HTML content pages that you are looking at (one on the left, and one on the right). To get around this right-click on the left hand menu frame (on some white space near the menu items) and choose ‘Open frame in new tab’. 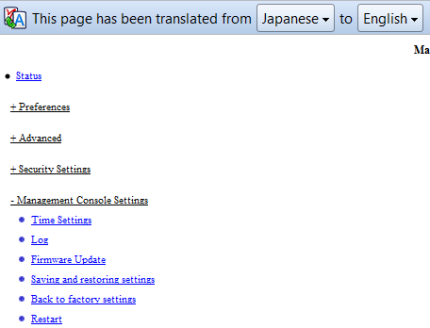 Go to the new tab and press the translate button when Chrome offers to translate it into English. You’ll now see the menus in English like this. If you don’t get offered the option to translate it you can try right-clicking on the page and if you get the ‘Translate to English’ menu item use that. This entry was posted on Saturday, June 5th, 2010 at 6:53 am and is filed under Computing, Japan. You can follow any responses to this entry through the RSS 2.0 feed. You can leave a response, or trackback from your own site. Hi Alekun, I have no idea, but maybe someone who is also on J-COM cable in Japan will read this and help! I will call J-COM support and if I can fix will write it here for next one! Hey, I managed how to fix it! So if you have a similar problem, just run the “auto config” clicking on “??? ?” and voila! Thank you for the steps you have described. Was in two minds whether to buy the router or not.The description that you gave in step wise helped me make a decision! I was worried about getting a router until I read this. Thanks for writing this, I’m sure it has help put many new Gaijin’s minds at ease (at least in reference to wifi)! Wow! Thank you very much for your help I was supposed to buy the Bufallo router last Sunday but I’ve read that it works for Japanese OS so I got confused, I tried to ask for help in that store but they don’t know what kind of router should they advice me to buy. Then browsed Google now and saw your site Thank you very much! I’m currently living in a leopalace apartment. I have a lan cable connection to the internet which asks me for username and password everytime I turn the computer on. Will a router like this still work for my case? is this instruction only for this brand(type) of routers? I live in a leopalace and just set this router up on your recommendation. It works a treat! Thanks for taking the time to write this up. I was really struggling for a minute! the suggestions are very useful. 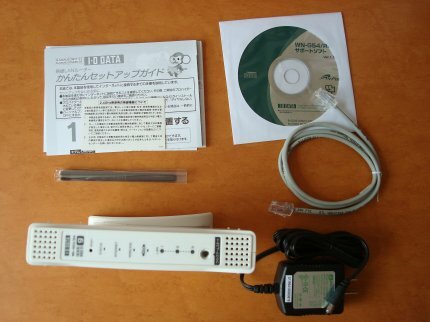 we are not familiar with Japanese router. all the steps have been clearly discussed here.